I stumbled across so many amazing sites recently. A dozen of tabs, one after another, trying to find some ideas to write on my blog. Aku perasan kebanyakan blogger ada niche mereka sendiri. Persoalannya sekarang, perlu ke ada niche blog? Apa itu niche blog? Dari fahaman aku, niche blog ni merujuk kepada sebuah blog yang dibina khusus untuk satu topik sahaja dan berkaitan marketing. For example, if you decide to blog about beauty, then the entire blog will focus on beauty product, beauty tips and everything related to it. Kalau tentang travel, maksudnya blog tersebut akan tulis tentang travel sahaja. Itulah maksudnya niche blog. Hanya untuk topik spesifik sahaja. I HATE IT. As to me, finding a niche for my blog is extremely difficult. I wanted to write about beauty stuff, but I'm not into it. I wanted to write about foods, but I don't really go for outside meals cause I usually eat at home. I wanted to write about recipes, but I rarely making food experiments aka cooking. I wanted to write about clothing, but my daily outfit is only jeans and plain T-shirt. I wanted to write about places, but I rarely going anywhere. Obviously, the idea of having a niche is not going to help me to develop my site. I can write about all those stuff, but to focus only on one topic, I will definitely have a hard time maintaining my site. In my opinion, it is much better to write about anything we love. Just be who you are and blog in a way that makes you happy. Trying to focus on a specific topic will be a burden to you unless you are really good at writing a review or describing something. But what if you are no longer interested in the topic? Of course by having a niche blog, you will have a successful site. And the possibility for you to make money from blogging is higher compared to a leisure blogger. But that doesn't mean a blog without niche can't be successful too. It's all about how we care and handle our precious little blog. If you force yourself writing something you dislike, trust me, it will make you sick of blogging and you will come out with nothing. I guess that is the solid reason why we always have a writer's block! When you write, write about something that you yourself want to read. Kalau kau tulis tapi kau sendiri tak berminat nak baca content kau, then don't expect orang lain nak baca. It's simple as that kan? But on top of that, it still depends on yourself. Kalau kau rasa nak fokus satu topik sahaja, then go for it. Kalau nak put together everything in one blog pun boleh. Just write about anything you are passionate about! I agree that niche will give a big hit to your blog. But I disagree when someone said without a niche, a blog is nothing. Oh come on, with or without a niche, all of us will be a successful blogger regardless of how we choose to manage our blog. I believe everyone has their own ways to keep the blog sparkling! As for the conclusion, I did choose to go for a lifestyle blog since the beginning because I am simply a passionate person who have tonnes of interests and my blog is simply myself non-human version! (It's a reflection of me.) I chose to build a site where I can be myself, share any thoughts of mine and not being trapped with specific interest or expertise area. 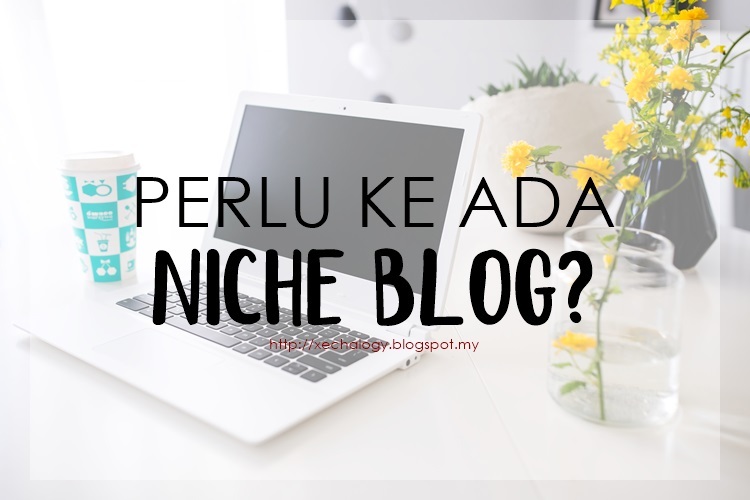 Now back to the question : Perlu ke ada niche blog? Jawapan aku adalah tidak sebab ada niche ataupun tak, kita tetap boleh jadi blogger berjaya dengan cara kita sendiri. Apa pendapat anda? Setuju atau tak setuju dengan niche ni? betul. kalau menulis mcm ni tak blh nak paksa. just go with the flow kata orang. prektis melalui benda yang kita suka nak share. senang daripada terikat dgn satu niche je. sy setuju. dua2 ada pros dan cons jugak. tapi dua2 tetap okay jugak. adil lah kan hihiih! tak ada niche langsung... tapi saya lebih fokus tentang perkembangan kesihatan anak saya yang mengidap penyakit jantung yang serius dan juga tentang sejarah lombong tembaga mamut. thats all. pun ok jugak tu! ada byk topik yg kita blh buat sbb tu lah ssh nak pilih satu. lastnya campur je semua. blog fae takde niche. i can say that blog fae more into blog cincai2 haha. same goes to my blog fae! hahah. no niche! sama! asyik tulis benda sama je mesti bosan kan.
Love this post. I totally agree. Memang banyak blog yg takde niche.. Tp klu perasan kan, klu blog ada niche ni lagi senang nk top, lagi2 yg share gossip2 hangat artis tu. apapun, blog to express not to impress, jadi ada niche ke xde niche ke bantai je ahaha. Mcm cikepal pun blogger lifestyle, kekdg fesyen, travel, relationship, artis..
hampir sama entry kita. hahahaha, xprasan kmk. tapi satu je ema perasan , ema byk cerita pasal seni dan diy yg ema buat . hah suka SENI ? minat buat DIY ? nak belajar buat SABUN ??? syukur sebab saya blogger lifestyle yg cerita bercampur-campur. walaupun entry semua tahpape, hahaha! qila agreeeeeee on takpayah ada niche haha just update anything that we love sbb tu blog kita kan sukahati kita la kan ekeke. but same goes to them yg lololove beauty products hving their own niche; so senang stumble upon one blog je kan. but still tetap nak baca review dari org lain jgk so kena jgk open new tab and google lagi hihihi mmg ada pros n cons huhu. lastly, hope more ppl would update their blog with consistency + honesty tho T_T at least baca review betul dgn products/services that they gonna get hm. Actually, niche blog penting if you want to be a full time blogger or if you really into a certain thing other than writing sis. For me, selagi namanya blogger suam-suam kuku like me... tak kisah lah niche apa as long as I can have a blog and can write my idea. Kalau untuk blogger biasa biasa macam kita ni tak payah ada niche pun takpe. Tapi untuk full time and serious blogger, niche sangat penting.